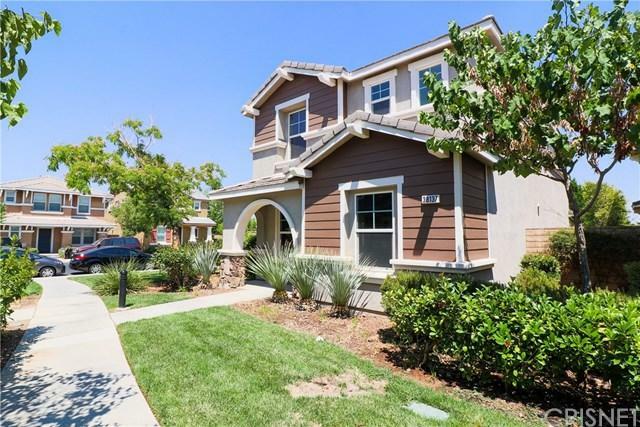 Prestigious two story town home, tailored with green manicured lawns, exquisite exterior paint, all nestled in a harmonious gated community on an ideal corner lot. Captivated as light illuminates through multitudes of windows, gleaming over custom wood like laminate flooring, refreshed carpet & bright white baseboards. Living room is kept crisp with a custom ceiling fan circulating air through the formal dining room and into the kitchen. The Kitchen is styled with elegant white counter tops with an additional overhang, cherry mahogany cabinets dressed with brushed nickel plated hardware & faucet, all brightened by recessed lighting. The indoor laundry room includes upper cabinets for additional storage. Float upstairs & into loft positioned next to the master bedroom featuring newer cozy carpet, immense walk in closet and spa like ensuite bathroom that includes a soaking tub & separate shower. Further find 2 additionally generous bedrooms & notice all the doors are fitted with upgraded panel doors. Lowered energy bills & increased comfort are obtained through a radiant barrier in the attic. Be at peace while relaxing on in the private patio area that is shaded with an exceptional cover & enhanced with new rock and pavers. It is perfectly positions and spacious for out door entertainment & bbqs. The Vineyards is a beautifully well-maintained community with tot lots, basketball courts, a tennis court and several BBQ areas throughout the community. Sold by Lexia Portillo of Real Estate Professionals Of.